Preview The Invisible Crime Part One and Part Two by going to The Invisible Crime website. What happens when a typical, upper-middle-class man from a respectable American family becomes the target of a covert organization bent on controlling both mind and body? When that secret organization is armed with high-tech weaponry which includes microchip technology aimed at controlling the minds and actions of its victims, terror reigns. 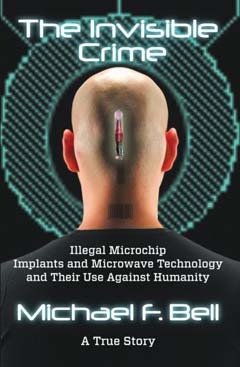 In this chilling, true-life account, writer Michael Fitzhugh Bell is drugged, abducted, raped, and surgically implanted with microchips. Tracked and tortured, Michael's predators can even read his thoughts. In this battle of man versus technology turned against us, Michael must prove his case to the police before his attackers not only eliminate Michael's memory-but eliminate Michael. From the terror of being electronically stalked to the horror of surgical microchip implants and mind control. Michael Fitzhugh Bell's experiences as a victim will leave you shocked and amazed. His uphill battle with doctors, lawyers, police, Government, F.B.I., C.I.A., and a secret criminal underworld begins in Hollywood, races into and through the North Carolina backwoods, and then back to California. As you experience Michael's journey on each horrific page, you will see actual medical photos, X-rays, ultrasound and MRI images, all showing non-therapeutic tracking and torture devices. These instruments and tools are available to anyone on the Internet, including criminal organizations like those which targeted Michael Bell. His battle for survival continues today. "What if someone could read your mind, manipulate your dreams, and see and hear everything that you do? What if you were followed and tracked everywhere you went? What if voices were electronically beamed into your head and you were shocked by directed or microwave energy, just as you were drifting off to sleep? What if the technology that made this all possible had actually been in existence for over fifty years and kept secret? What if you became the Victim of the crime and technology and nobody believed you?" Part Two is the sequel to Michael Fitzhugh Bell's first book. 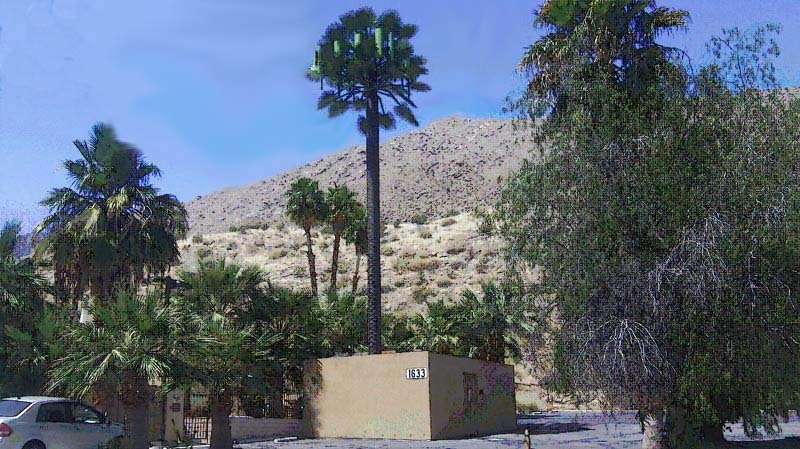 Less than ten days after moving into Michael's apartment in Palm Springs, California, this covert cellphone tower was installed in a parking lot directly across the street from the apartment building. The entire structure including the base, was installed overnight. One day it was an empty parking lot, the very next morning this camouflaged cellphone tower appeared. This cellphone tower is less than 100 yards from Michael's apartment. In this controversial true crime story and expose', author and investigative journalist, Michael Fitzhugh Bell reveals a new form of Covert Domestic Terrorism that is being perpetrated on innocent United States Citizens and millions of people around the world. In his first book, Bell describes how he became an unwitting victim of the United States Government, he's known as a Targeted Individual. Bell has been Illegally implanted with nonconsensual, non-therapeutic biomedical implant devices which cause severe suffering, physical torture and psychological terror. This crime has infiltrated every aspect of society and is secretly flourishing at the expense of the U.S. Taxpayer. 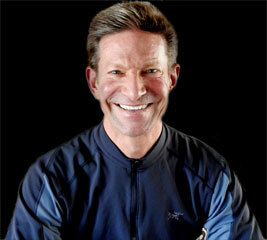 Whistleblower Michael Fitzhugh Bell is a victim of what is referred to as an Unacknowledged Special Access Program (U.S.A.P.) created by the United States Government, believed to be part of the Military Black Ops portion of the Shadow Government. Bell is victimized through the illegal misuse of advanced nanotechnology, biomedical devices embedded throughout his body, using clandestine Government Classified Technologies. The first book demonstrated this and used actual verified Doctors reports and documented medical images to prove this fact. Bell is under constant attack by Bioelectronic Torture Weapons, 24/7, in a non-stop assault on his life, fighting on the front lines of this battle of survival all day, everyday. In this ongoing account, the author discloses details and unveils an evil truth hidden in plain sight. This second book shovels hard at unearthing the little known crimes of Organized Stalking, Bioelectronic Torture/Electronic Harassment and Mind Control. "The Invisible Crime - Part Two - A Targeted Individual, Synthetic Telepathy, and Global Criminal Biomedical Human Experimentation - A True Story", goes further than previously in print, disclosing an astonishing truth that remains part of a secret Government Human Experimentation and illegal, non-consensual clinical trial test program. Synthetic Telepathy is the process of hacking the human mind using a supercomputer and analyzing and deciphering a human being's thoughts in real-time via their emanating brainwave frequency. Michael Fitzhugh Bell is being illegally stalked and tortured wherever he goes, under constant remote electronic surveillance, stripping him of his civil liberties and privacy and severely compromising his health and his life. His every thought being read in real-time using classified technologies by a sinister Government obsessed with control. This true crime story, told through the eyes of Michael Fitzhugh Bell, takes the reader on a horrifying journey from a life of freedom to one of human enslavement. Bell reveals how his life has been shattered by an ongoing cruel and inhumane, criminal, unethical, experimental Biological Weapon in the form of an unnatural, manmade pathogen that he was intentionally infected with. This skin condition, Morgellons Disease, is an unexplained, uncommon skin disorder which is generally characterized by crawling sensations on and beneath the surface of the skin, and fiber-like filaments that emerge from lesions on the surface of the skin. 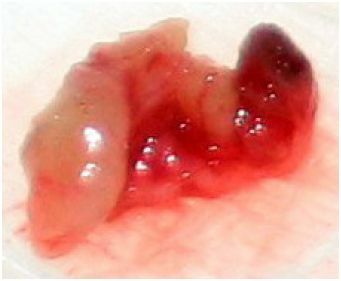 Doctors refuse to recognize this disease as it's part of a highly-classified U.S.A.P. and does not officially exist. This account is validated by cold hard facts and is presented with additional evidence using diagrams, illustrations and actual photographs and Medical Imaging. In reading this story it's important for the reader to keep an open mind and their seat belts securely fastened.